The current week's homily is available on a link on the front page of the website next to the link for the current week's bulletin. On the page with the prior bulletins, the corresponding homily will be sitting side by side with its bulletin. We started on the anniversary of the start of the Catholic Church, Pentecost Sunday --- over four years ago. This mass, Second Sunday of Easter, is our three hundred and twenty fourth podcast to be posted. The homily is given by Father James Brady. Many of you have come to me offering to help with improvements to our church building. The sanctuary carpet is in need of replacement after decades of use. The handrails in the sanctuary could use replacing by some more fitting to sanctuary decorum. Our bathrooms are sorely in need of updating and being made handicapped accessible. Some have mentioned wanting to see the restoration of our beautiful sanctuary lamp. 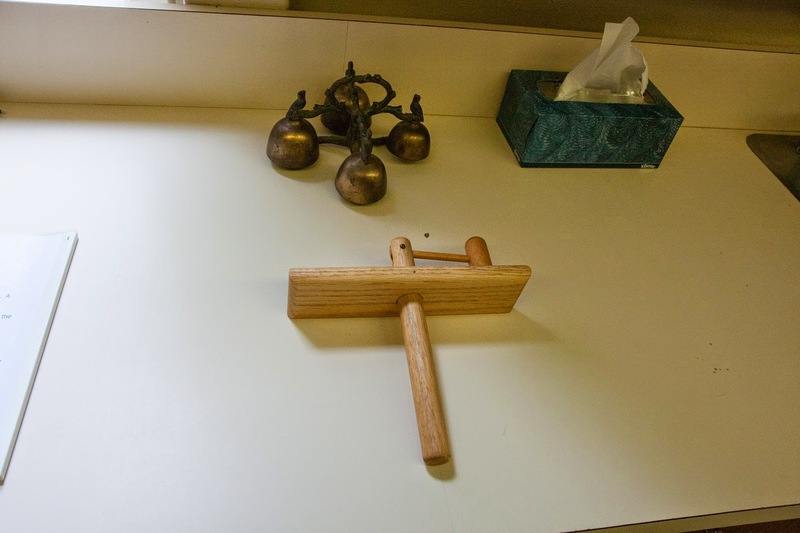 Currently, we do not use a fitting altar for our worship as our current altar is a table moved from the rectory some 40 years ago when the previous altar was broken. Because of this, we cover the altar with altar cloths. As a Eucharistic Community, we should provide a fitting altar for our most important formal worship, The Holy Eucharist. With the approval of our Finance Council and Parish Advisory Board, we've begun a campaign to make all of these needed improvements to our church building: “The Sanctuary Project.” The cost of all of these improvements is about $100,000. This is a St. Landry Church project in which we want all to participate in any way they can and know of our appreciation for their support. All identifiable gifts will be recognized in the bulletin by name or memorial alone, as requested by the donor. If we are blessed in receiving donations exceeding the costs of current planned improvements, we will use those donations for other improvements here in our church building – namely, improved lighting and sound as well as pew repair or replacement. Although the campaign will officially start later this spring, we can accept donations now. Some of you have already heard about it and have pledged support as well as made donations. Many thanks to those who have already responded! As your pastor, I am very excited about The Sanctuary Project. Although we are certainly pleased when projects are undertaken and achieved, the real joy is seeing the generosity of heart that underlies the project as thanks to God for what He has already given to us. It is a sign of the health and vibrancy of our community because of the Love of Christ that resides in our hearts. God Bless you all! The bulletin for the week of April 27, 2014 has been posted. Click here to see it. 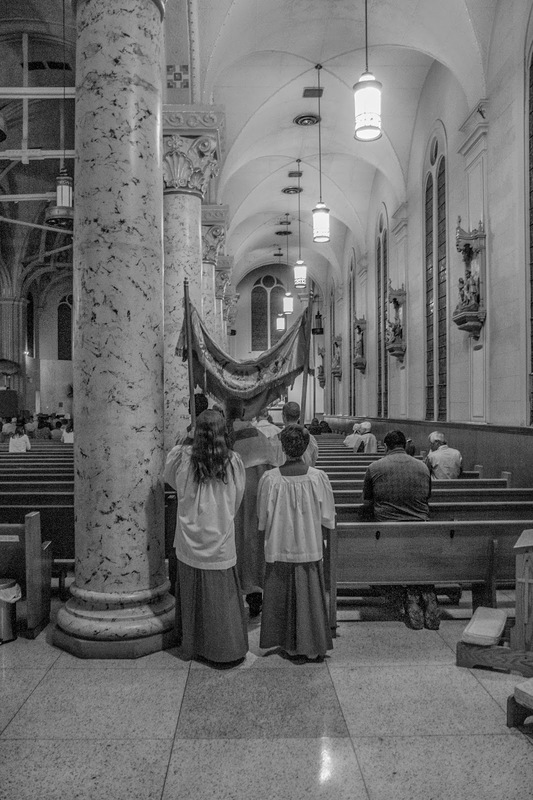 Here is a little sample of the music from last night's Easter Vigil Mass. JP Poirier leads the St. Landry Catholic Church Choir in "It is well with my soul". The current week's homily is available on a link on the front page of the website next to the link for the current week's bulletin. On the page with the prior bulletins, the corresponding homily will be sitting side by side with its bulletin. We started on the anniversary of the start of the Catholic Church, Pentecost Sunday --- over four years ago. This mass, Easter Vigil, is our three hundred and twenty second podcast to be posted. The homily is given by Father James Brady. Alleluia, Alleluia!! The Lord is Risen! We rejoice today because of God's goodness to us in giving us the gift of eternal life. We now celebrate Easter for 50 days, 10 more than Lent, because we are an Easter people, living in the hope of the Resurrection! While we acknowledge the struggle of our earthly life during the 40 days of Lent, we now celebrate the gift of eternal life for the 50 days of Easter. We especially celebrate Easter during this coming week, which is referred to the Easter Octave. The Easter Octave ends next Sunday, which is commonly referred to as Divine Mercy Sunday. Fittingly, during the Easter Season we will celebrate two of the sacraments of initiation, First Communion and Confirmation, and we will celebrate the Easter Season as a community with our parish picnic. Please be sure to keep our second graders and high school juniors in your prayers as they make their final preparation for the reception of these sacraments. As previously announced, our annual parish picnic will take place on May 4, 2014 after the 10am Mass. It is our community's way of celebrating God's Easter gift to us. Please be sure to mark your calendars and join us for theses celebrations! The bulletin for the week of April 20, 2014 has been posted. Click here to see it. 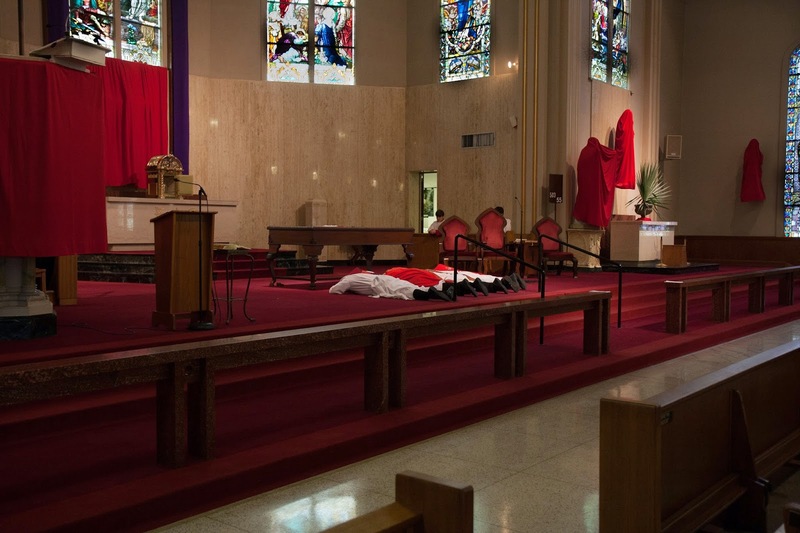 We've got photos from Good Friday at St. Landry Catholic Church, Opelousas, Louisiana. Click here to see them all. The current week's homily is available on a link on the front page of the website next to the link for the current week's bulletin. On the page with the prior bulletins, the corresponding homily will be sitting side by side with its bulletin. We started on the anniversary of the start of the Catholic Church, Pentecost Sunday --- over four years ago. This service, Good Friday, is our three hundred and twenty first podcast to be posted. The homily is given by Father James Brady. We've got photos from last night's mass and procession at St. Landry Catholic Church, Opelousas, Louisiana. Click here to see them all. The current week's homily is available on a link on the front page of the website next to the link for the current week's bulletin. On the page with the prior bulletins, the corresponding homily will be sitting side by side with its bulletin. We started on the anniversary of the start of the Catholic Church, Pentecost Sunday --- over four years ago. This mass, Holy Thursday, is our three hundred and nineteenth podcast to be posted. The homily is given by Father James Brady. The current week's homily is available on a link on the front page of the website next to the link for the current week's bulletin. On the page with the prior bulletins, the corresponding homily will be sitting side by side with its bulletin. We started on the anniversary of the start of the Catholic Church, Pentecost Sunday --- over four years ago. This week, Palm Sunday, is our three hundred and eighteenth podcast to be posted. The homily is given by Father James Brady. Today we celebrate Passion Sunday, also known as Palm Sunday. It marks the beginning of our remembrance this coming week of the events that give rise to our salvation, Jesus' Passion, Death and Resurrection. There are several special liturgies and other events this week. Please check the insert in this bulletin for our Holy Week schedule. 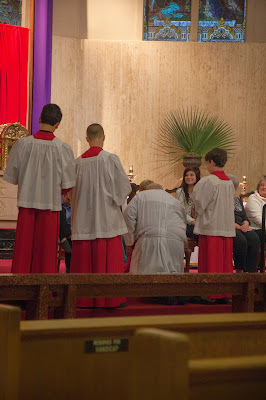 A special effort should be made by each of us to attend the major liturgies of the Easter Triduum, namely Holy Thursday Mass celebrating the Institution of the Eucharist, Good Friday Services commemorating our Lord's Passion, and the Easter Vigil. Easter weekend often begins early in the secular world, with our children having off from school and many places of employment closing Good Friday for the Easter weekend. This extra time gives us the opportunity to attend the Triduum Liturgies. A thought for reflection this week: If we can make time for other social events during the Easter Holiday, then should we not also be able to make time to attend the Easter Triduum Services? And if we cannot make the time, then do we need to examine our priorities? We know what Jesus' priority was during this time. God Bless, and may this week fill you with Christ's love, and the zeal to act on it!! The last scheduled confession before Easter will be Wednesday, April 16 before 12:05pm Mass. The bulletin for the week of April 13, 2014 has been posted. Click here to see it. The current week's homily is available on a link on the front page of the website next to the link for the current week's bulletin. On the page with the prior bulletins, the corresponding homily will be sitting side by side with its bulletin. We started on the anniversary of the start of the Catholic Church, Pentecost Sunday --- over four years ago. This week, the Fifth Sunday in Lent, is our three hundred and seventeenth podcast to be posted. The homily is given by Father James Brady. Last weekend, we passed the halfway point of Lent. Our focus slowly shifts from the fundamentals of removing sin from our lives and being more fervent in our prayer (Our Love of God), almsgiving (Our Love of Neighbor) and fasting (The discipline necessary to live a Christian life) to the Paschal Mystery (suffering and death leading to new life). It is a good time to take advantage of Sacramental Confession and to meditate more deeply on the coming commemoration of Jesus' Passion, Death and Resurrection during Holy Week. If we have not been faithful to our Lenten goals, it is never too late to begin! If we have succeeded in our Lenten goals, we thank God for the Grace of conversion. If we have failed in our Lenten goals, then we are humbled (in a good way) and realize our weakness and need for God's strength. In any case, we don't give up, but keep trying! God knows that we all struggle to live a good life in imitation of His Son, and delights in our effort, knowing it leads to a strengthened relationship with Him. Our continuing struggle gives us new life in Christ, and thus we live the Paschal Mystery every day, looking forward to our Easter Resurrection at the end of our earthly life. We also look forward to our Easter celebrations as a parish. Please keep in prayer our children preparing for First Communion and young adults preparing for Confirmation. As usual, First Communion will take place at the 10am Mass on April 27, 2014 and Confirmations will take place at the 5pm Mass on May 25, 2014, with Bishop Jarrell as celebrant. Our annual parish picnic will take place on May 4, 2014 after the 10am Mass. Please mark your calendars and make plans to attend and celebrate these wonderful events as a parish family. May God continue to bless you during this Lenten Season! Congratulations to our very own Yvonne Normand, who was named the Chamber of Commerce's "Citizen of the Year" last week. This is the highest honor bestowed by The Chamber and recognizes Yvonne's service to St. Landry (civil) Parish as well as her work here in Opelousas and at St. Landry Church. Yvonne and her husband Keith, along with their children, are long time parishioners here at St. Landry. Her family's dedicated service to our community goes back to her parents. Of course, her father, Deacon Arthur Lognion, served here at St. Landry and is still gratefully remembered. Yvonne's dedication and service to our church has always been greatly appreciated, and we are happy that her service to our greater community has been so fittingly recognized. Tuesdays at 6pm – Lenten Gospel Study. The study is in a modified “Come Lord Jesus!” format designed for Lent. The bulletin for the week of April 06, 2014 has been posted. Click here to see it.